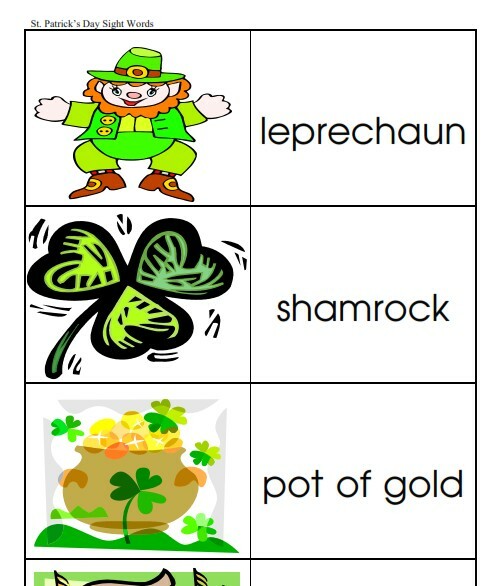 Our early learning printables, including our free St. Patrick’s Day printables are in PDF format, if you don’t already have Adobe Reader, you will need to download it to access the free printables. Storytime Standouts offers interlined paper for (almost) every occasion, check out the entire collection by visiting our writing paper for kids page. 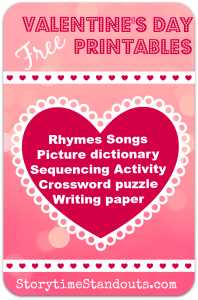 Young children, parents and teachers are sure to enjoy these free Valentine’s Day theme printables. 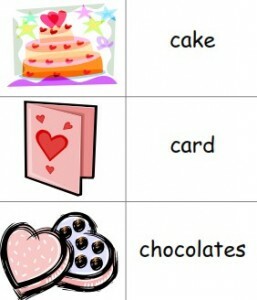 * Making a Valentine – a Valentine’s Day sequencing activity. This could also be used as a matching game. A perfect book to share for Valentine’s Day, Love is You & Me. (Monica Sheehan’s warmhearted follow-up to be happy!) delivers a reassuring message that will be enjoyed equally by young children and all those who care deeply for them. Light and breezy, You: A Story of Love and Friendship has got it right. The world is more colourful, more musical and more exciting when shared with a true friend. In this picture book about friendship, happy and engaging illustrations invite us to watch as a friends work together to transform a drab birdhouse into a bright and inviting home. When the work is done, they joyfully play music together and manage to endure the highs and lows that life brings. The world is an exciting place, with ups, downs, around and arounds, and far-far-aways. But the most exciting place in my world is with… you. Well-suited to very young children, You is a picture book about friendship and love. It would be a a great story to share before a parent or friend leaves on a trip. Be sure to visit the author’s website (link above) and read about Stephen Michael King’s experience as a hearing impaired child and his path to becoming an author-illustrator. I have the good fortune to share read alouds with children regularly in my classes. I always look for engaging stories that will hook my students. Sometimes I am lucky enough to find a book that doesn’t just hook the kids – some books have children talking about the story a week later and begging for a reread. Zero Kisses for Me is one of those delightful books that children love to see, listen to and cheer about. Life is tough when you’re “always being kissed.” When you’re kissed before you go out in the rain and when you’re kissed and called, “Honeybunch” or “Flower Bud.” By the end of the day, you can be “tired of being everybody’s tootsy-wootsy… huggy-bear… kissy-snooks.” You might even demand, “No more mush!” And, you might exclaim, “BLEAH” – the perfect word to make a story memorable and a great word for young children to hear and relish. Fun illustrations add to the atmosphere in Zero Kisses for Me and convey the little bear’s determination and frustration beautifully. 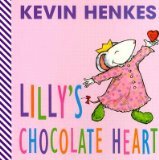 A great read aloud for boys and girls, aged four to six, especially those who enjoy many, many kisses each and every day. Although not a Valentine’s Day book, this would be a terrific choice to reach for on February 14th. Our early learning printables, including our Valentine’s Day theme printables for preschool, homeschool and kindergarten are in PDF format, if you don’t already use Adobe Reader, you will need to use it to access the downloads. 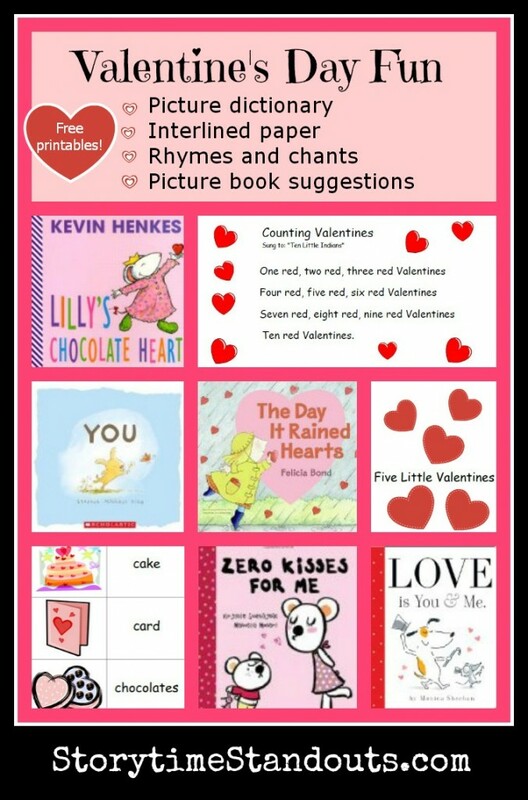 Free printable Valentine's Day picture dictionary for readers and writers in kindergarten and grade one. 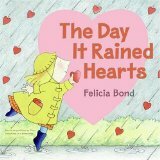 Follow Storytime Standouts’s board Valentine’s Day for Kids on Pinterest. We offer more than two hundred free PDF downloads on this website. Some are available to everyone, for others you need to register on the site. There is no cost for any of the downloads. Today, we are highlighting our free picture dictionary PDFs. These are perfect for beginning readers and writers. They can be used in a variety of ways including offering children an opportunity to “read” the pictures for clues about the words. 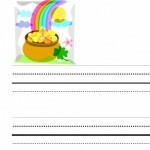 These printables are also great for children who want to write stories and want to use interesting words but don’t know how to spell the words. If you print the pages and cut them apart, they could be used as a matching activity. I have not included seasonal themes in this list (i.e. Valentine’s Day, St. Patrick’s Day, Halloween and Christmas) – if you are interested in seasonal themes, be sure to check our Picture Dictionaries page for more resources. Free printable baking cookies picture dictionary for readers and writers in kindergarten, grade one and ESL. 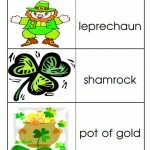 Free printable color picture dictionary for readers and writers in kindergarten and grade one. Free printable firefighter picture dictionary for readers and writers in kindergarten and grade one. Free printable weather picture dictionary for readers and writers in kindergarten and grade one. Our early literacy printables, including our free printable Picture Dictionaries are in PDF format, if you don’t already use Adobe Reader, you will need to use it to access the downloads. If you appreciate our free early literacy printables, please support this site by visiting and purchasing from Amazon.com or Amazon.ca.